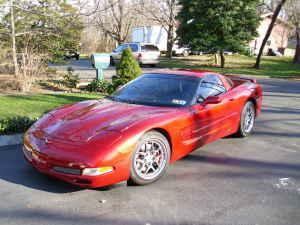 Hello and thank you for viewing this listing where I am selling my awesome 2002 Chevrolet Corvette. I just cannot afford to have a second car anymore, especially one that i use not even once a month on average. Vara-Ram true forced cold in intake system, and there are a few other little things under the hood. The exteriors as well have many upgrades, one being a rear spoiler wing. This car HAS ALWAYS been garage kept, and the interior leather has always been treated with Armor-All leather wipes. This car also, hasn�t ever been driven in any harsh conditions such as rain, sleet, snow etc... Okay so the car has 50,400 miles and has been a head turner for nearly all of them! I will be doing this sale through GMAC at Seacoast Chevrolet, so I can save on sales tax. Financing will be available from them, so you may trade in your car. $19,999 Firm. If you are a serious buyer, please contact me at 732-539-7130. You may also email me at **dframptonot@gmail.com** if you are a serious buyer. Any scam/spam mail I receive will just be deleted, I'm too smart, I know when its a scam.